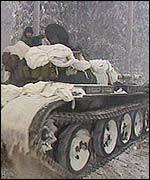 On the edge of Europe, Finnish troops in winter camouflage crawl through the snow to attack a tank on exercises less than 100 kilometres (60 miles) from the Russian border. 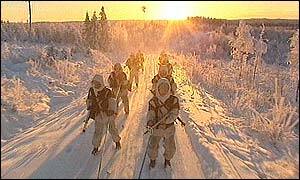 For years, Finland was mired in awkward neutrality, stuck between Nato and the Warsaw Pact. But times are changing, and the East-West divide has gone. Now the Finns are offering troops for a new military initiative. As a member of the European Union, Finland intends to be part of the EU's new rapid reaction force. By 2003, the EU wants to be able to deploy 60,000 troops within 60 days to troublespots around the world. The aim is to give the EU some kind of military capability as its common foreign policy splutters into life. It will not be easy. Military spending across Europe is falling, and the EU still lacks many of the ingredients for successful military deployments. It needs heavy airlift, better intelligence, and the right kind of troops. Some of these things are in the pipeline, but they will take years to arrive. Critics argue that the plan is fatally flawed. The man who has to prove them wrong keeps a hectic schedule. 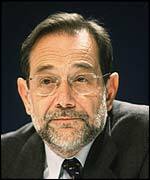 Javier Solana spends half his life on the road. As the EU's High Commissioner for Common Foreign and Security Policy, his task is to represent the 15 member states collectively on the world stage. We travelled with him for a few days, from Brussels to Jerusalem, from Ramallah to Berlin. There is an air of organised chaos - timings are tight, meetings are delayed, conversations overrun. But however imperfect, the EU now has a team in the field. Breaking bread with Palestinian leader Yasser Arafat may seem a long way from debates over European defence capabilities, but there is a link. If EU foreign policy is to become more effective, it needs a military component. Not as a threat, just as a fact of life. "By the time we complete the process of enlargement, the European Union will have twice the population of the United States and four times the population of Japan," says Mr Solana. "We don't want to be a superpower, but we have to get used to playing a greater international role, having a military arm to help with crisis management - and peacekeeping is an important part of that, it's inevitable." Mr Solana travels with a small team of officials. If this is the prototype for some kind of future European diplomatic service, there is a long way to go. The intention is clear. Already the largest donor of development aid in the world, the EU is now looking to punch its weight in other areas of foreign policy. "Of course there are shortcomings, and different countries have different priorities," says John Palmer, director of the Brussels-based European Policy Centre. "But there has been progress in the last few years." The trouble is that internal disputes often hijack the best laid plans, especially in the European Union. When the UK Prime Minister, Tony Blair, invited his French and German counterparts for dinner in London to discuss the crisis in Afghanistan, smaller EU countries were mortally offended. A few names were added to the party list at the last moment, but the bad blood lingered. So where will the real test emerge? When it comes to defence, probably in the Balkans, where thousands of European troops are already based under Nato and UN command. 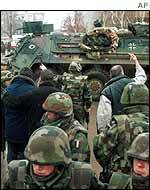 The last major Balkan conflict - in Kosovo in 1999 - provided the spur for the EU's current defence initiative. Kosovo was a European problem, but the military response was mostly American. It forced Europeans to face facts. They were ill-prepared to carry out operations in their own backyard, and they knew they could not rely on automatic American help forever. In Macedonia, a German-led Nato force provides security for international observers, and liaises with local villagers. It is part of a precarious but important success in conflict prevention. Macedonia is also exactly the type of operation the EU wants to do - keeping the peace in Europe, and using a military presence to create long-term stability. But at the moment, the rapid reaction force is an empty shell - the height of its immediate ambition a possible police deployment to Bosnia. But Euro-optimists, like European Commission President Romano Prodi, look to the future. "To have the euro we needed almost 45 years," Mr Prodi argues. "So don't be surprised if we need a lot of time to build - through democracy - our common foreign policy." It is easy to dismiss the EU's defence initiative, and the whole idea of a common foreign policy, as a non-starter. But despite all the problems, the EU knows its credibility is on the line. There is considerable political pressure for success. In one way or another, the EU feels the time is right to raise its international profile.